Nazareth House Apostolate Blog: Good Bye Ramada's! We will miss you! 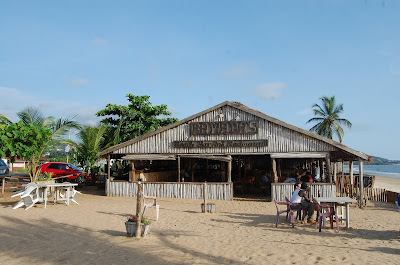 Its always hard to say goodbye, today we say goodbye to some of the best meals we've had in Sierra Leone, we say goodbye to some of our most relaxing times by the beach. 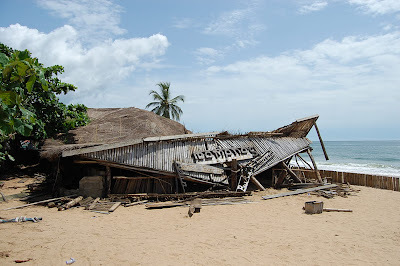 There were times when we were so tired from working in Freetown, dealing with frustrations, etc. that Ramada's was our little niche of peace. A place to recoup and prepare for the next day. With goodbyes, there is always a new beginning... and I wish Ramatu, the owner of "Ramada's" and her husband, the best of everything in whatever lies ahead. We all mourn the loss of such an endearing establishment, it has been a friend. 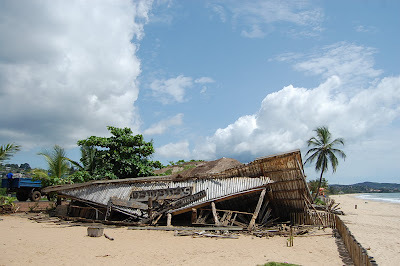 Shoreline, Sand, Former Beach Restaurants, Sunsets, New Construction of Freetown beaches as well as demolished beach bars can be seen in "Beaches of Freetown" link on right side bar of this blog. All photos are exclusive property of NHA.